Kolkata, 9th April, 2019: Paying homage to the contributions of our armed forces, Confederation of Real Estate Developers’ Associations of India (CREDAI) Bengal organized a ceremony as a tribute to those martyred in the Pulwama attack. An apartment flat was each given to the families of Late Bablu Santra of the 35th Battalion and Late Sudip Biswas of the 98th Battalion, the two slain soldiers from West Bengal, both martyred during the Pulwama attack in February 2019. Present during the occasion were Mr S Raveendran, IG. 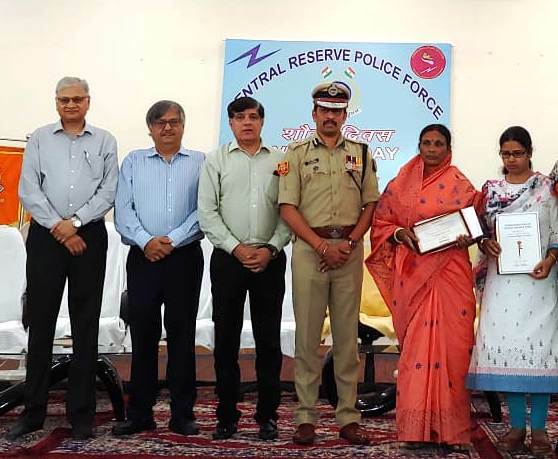 West Bengal Sector , CRPF and Mr Nandu Belani, President of CREDAI Bengal who handed over the promissory allotment letters to the next of kin of the two martyrs during the ceremony at the CRPF Camp, Salt Lake today. OnApril 9th, 1965 a small contingent of 2nd Bn CRPF, successfully fought and repulsed an attack by a Pakistani Brigade on Sardar Post in the Rann of Kutch, Gujarat, eliminating 34 Pakistani soldiers and capturing 4 alive. Never in the history of military battles have a handful of policemen fought back a full – fledged infantry Brigade in such a manner. In this conflict, six valiant CRPF men also attained martyrdom. As a tribute to the saga of the brave men of the Force, 9th April is befittingly celebrated as “Valour Day” in the Force. One flat has been donated by Alcove Group, a member of CREDAI Bengal, at their ‘New Kolkata’ project whilst the other flat has been funded through contributions from CREDAI Bengal members.